The stunning colour of the royal ceremony, the State Opening of Parliament. Queen Elizabeth II, longest reigning British Monarch. Today, Wednesday 9 September 2015, Queen Elizabeth II surpasses the record set by her great-great-grandmother, Queen Victoria, of 23,226 days, 16 hours and 23 minutes as a reigning British Monarch. That’s over 63 years on the throne. Wow! 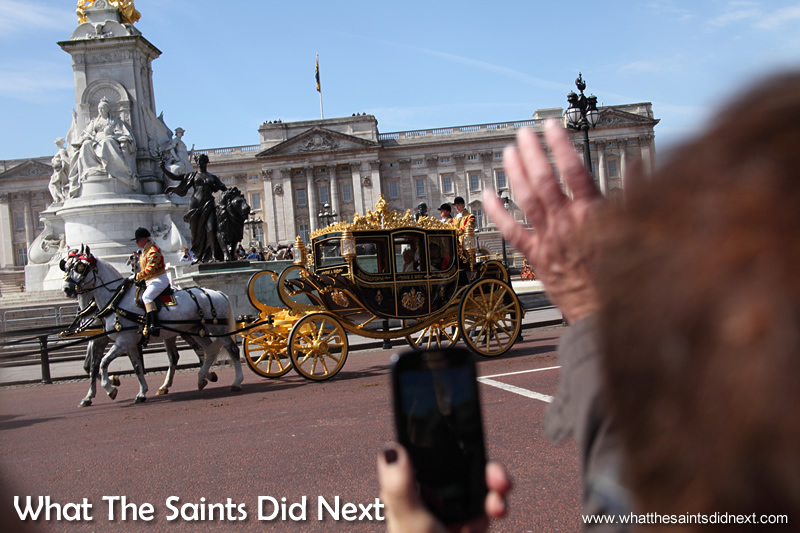 It makes now a good time to tell the story of when we saw the Queen for the first time. 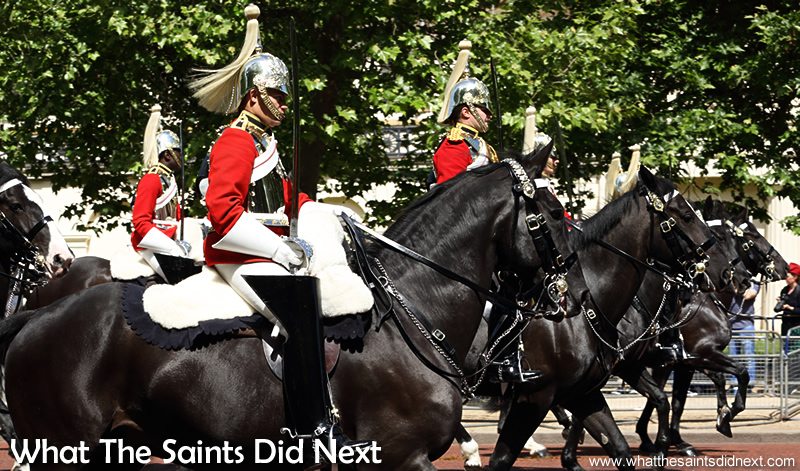 The Queen’s Horse Guards parading down the Mall, London. Let’s back up a bit to May this year. 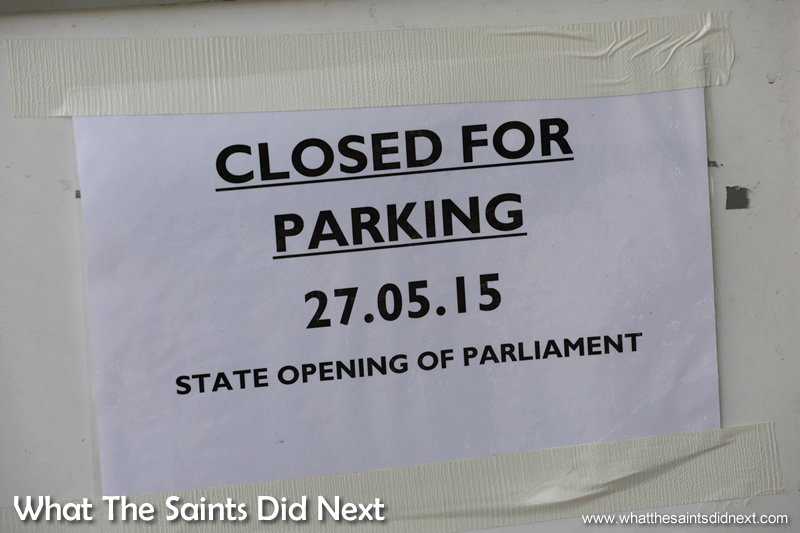 The annual State Opening of Parliament ceremony in London was about to take place. 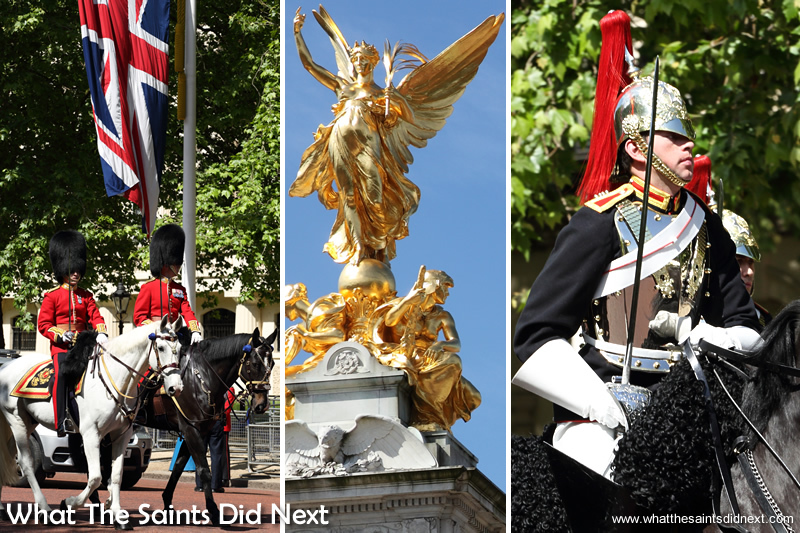 We had arrived an hour early via Green Park tube station and split up to get different angles of the procession which would travel from Buckingham Palace to Westminster. Darrin took the Mall and I wormed my way closer to the Palace. Jostling in a crowd, battling for elbow room is not my idea of fun but this was exceptional circumstances and I was determined to stand my ground. Just metres away the Queen of England would be passing in her fairytale carriage and my mission was to get a good picture. 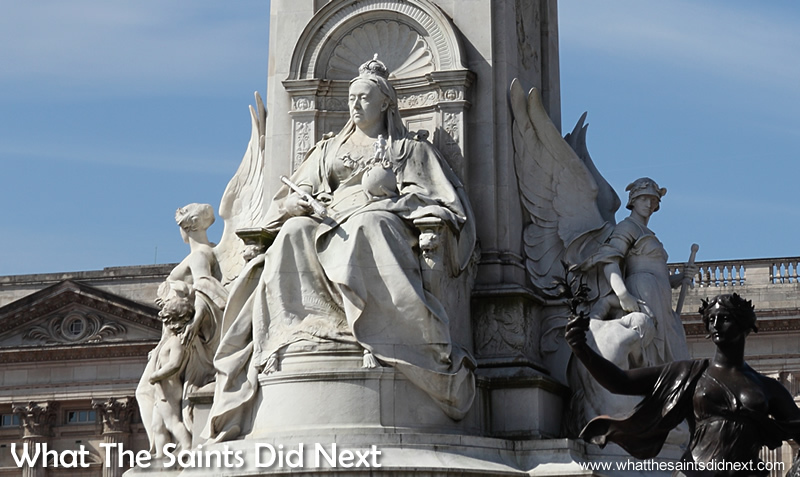 A sculptured Queen Victoria looked down from her marble monument, helping the armed police keep the swelling crowd under surveillance. 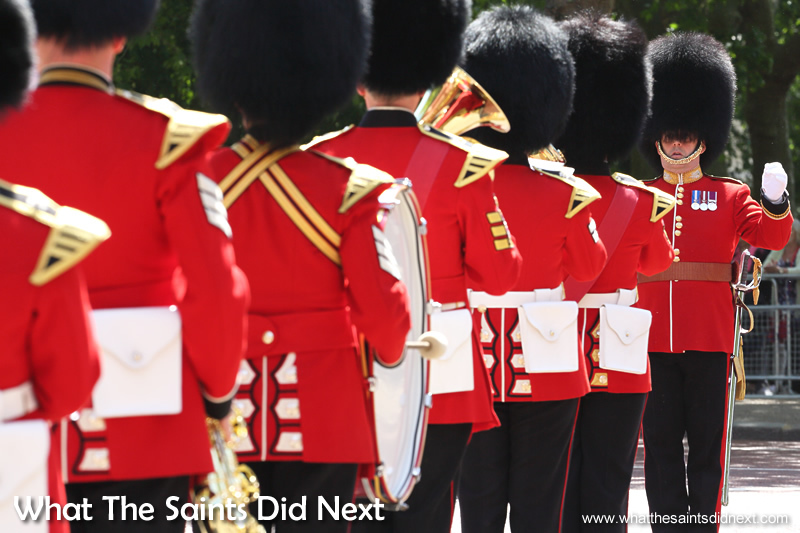 Red coated bearskin cap guards lined the iconic red asphalt of the Mall with very sharp looking bayonets fixed to their rifles. But all of this didn’t feel threatening, instead it added to the pomp and ceremony of the event. 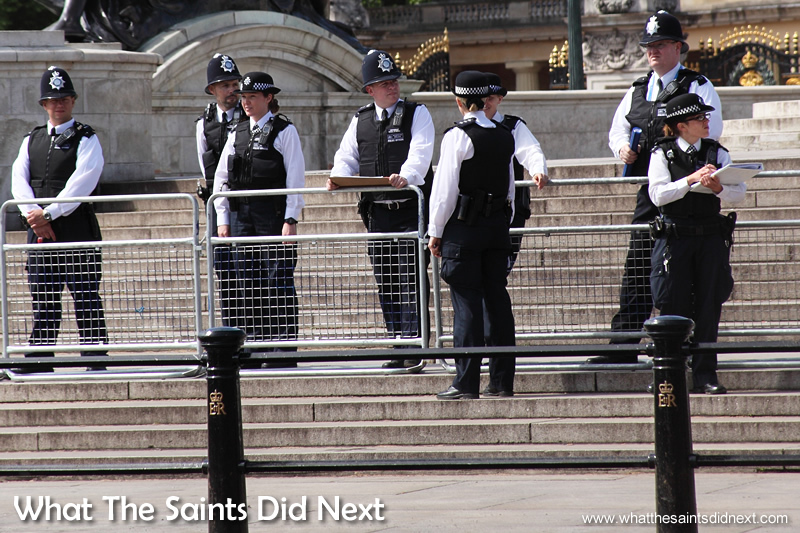 Police were even acting as information officers for tourists. Queen Victoria monument outside Buckingham Palace. 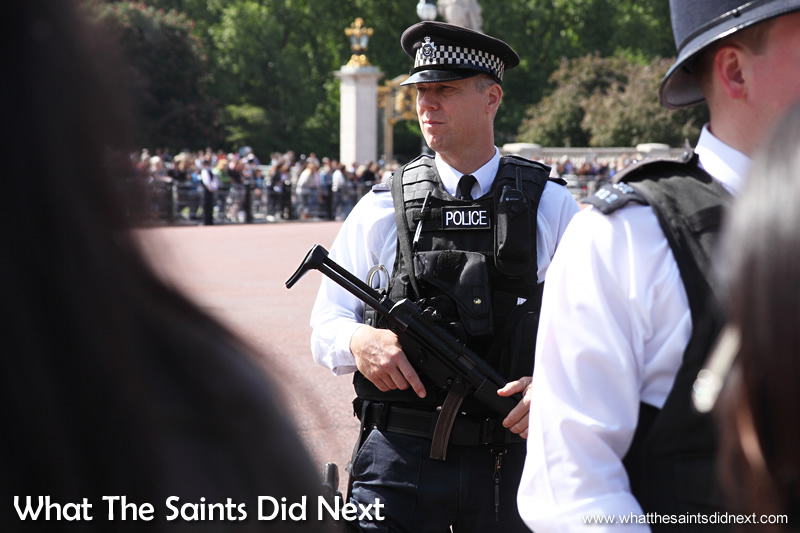 Armed police were on duty all along the route that the Queen’s carriage would take. Crowds waiting patiently for a glimpse of the Queen. Police on duty for the State Opening of Parliament. The band keeping the crowd entertained. Handfuls of official photographers with long telephoto lens were smugly positioned around the Queen Victoria Memorial, which was off limits to the public. The Royal Standard hung motionless atop the Palace. Despite a slight chill in the air it was a gloriously sunny day. The grand procession is underway from Buckingham Palace, captured by hundreds of camera phones. Queen Elizabeth II, longest reigning British Monarch. 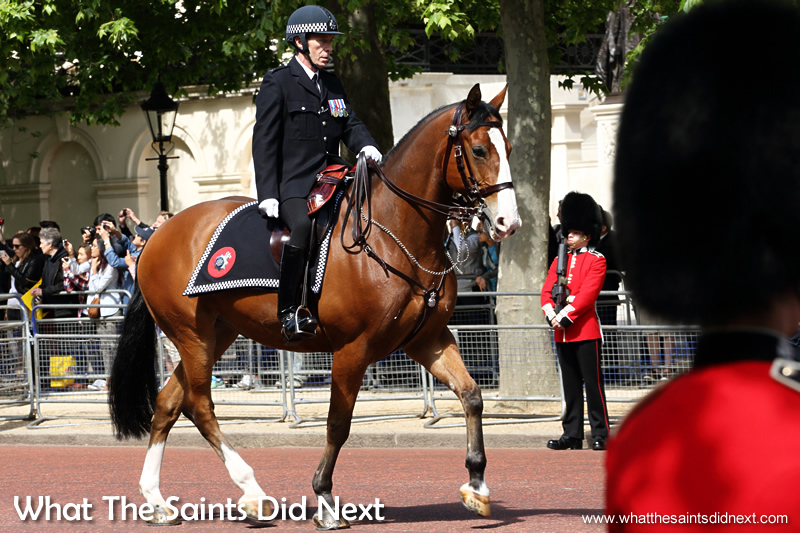 A mounted policeman leading the parade up the Mall. 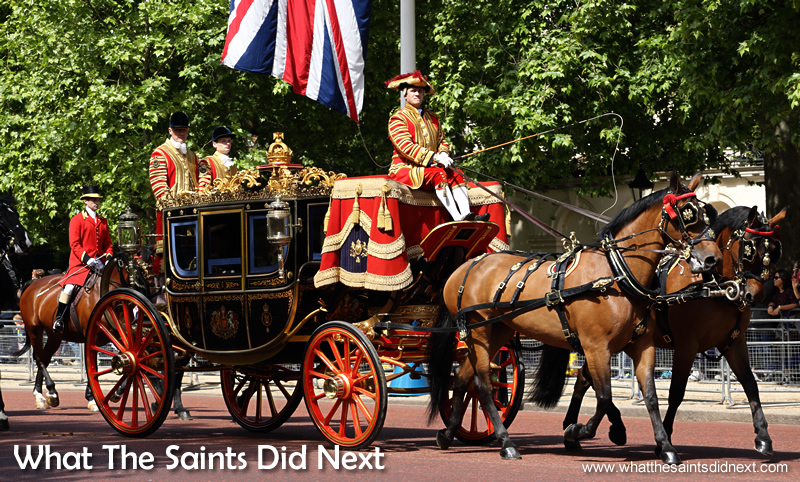 The British Royal Parade is a major tourist attraction for viitors to London. Queen Elizabeth II, longest reigning British Monarch. 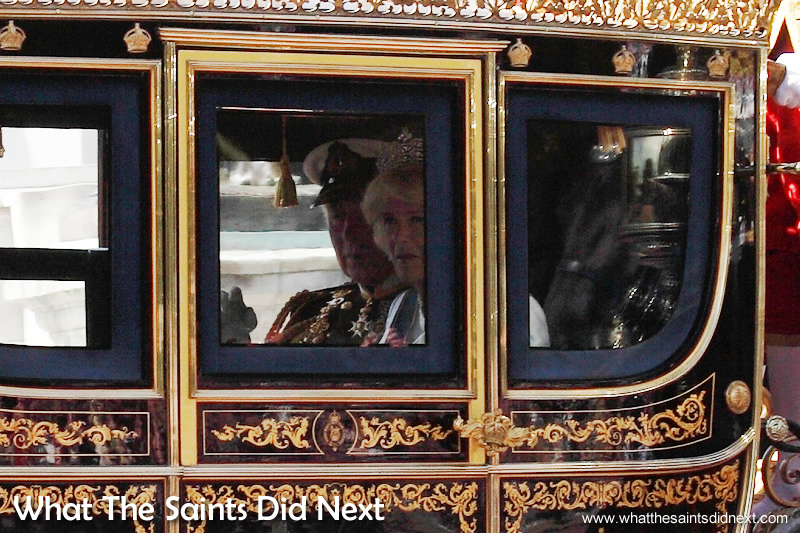 A glimpse of Prince Charles and Camilla inside one of the carriages. Finding a second row spot behind the railing on the Green Park side I waited along with pushy groups of foreign school children and hundreds of tourists, hopeful I’d be able to duck and dodge the camera lens around them. Of course, once the procession started it became a free for all. Elbows, heads and camera phones got in the way, but it was fun seeing the excitement the British Monarch generated in people of all ages, races and nationalities. The Queen’s Horse Guards escorting the carriages along the route. Queen Elizabeth II, longest reigning British Monarch. 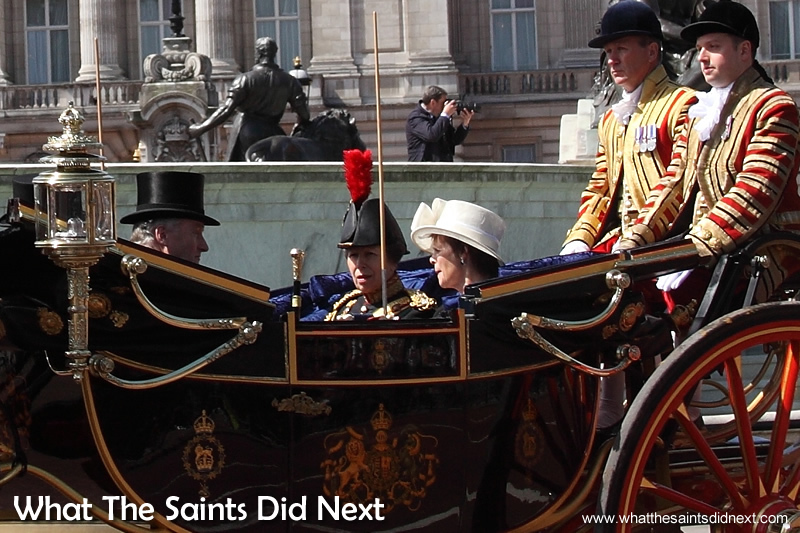 We all had a clear view of Princess Anne travelling in an open topped carriage. The splendour of the coach drivers’ uniforms was lit beautifully in the morning sunshine. 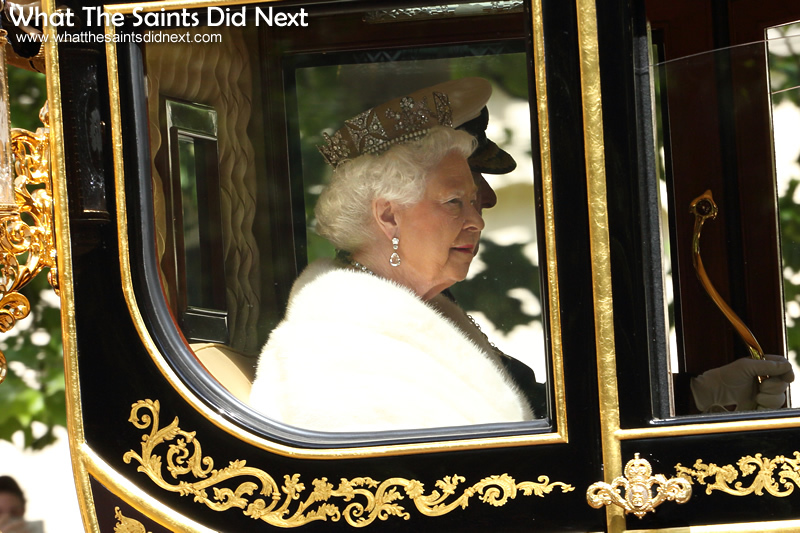 The Queen’s carriage leaves Buckingham Palace – trying to get a clean shot amongst the excited crowd. 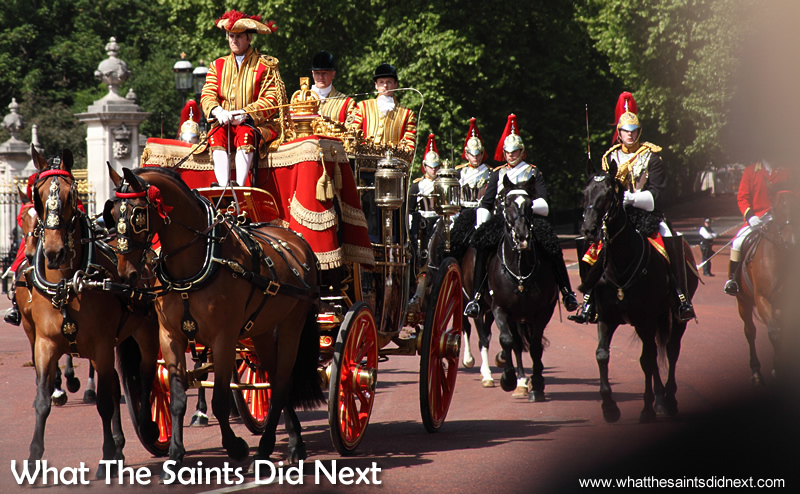 The Queen’s carriage pulled by six white horses, travelling up the Mall. Queen Elizabeth II, longest reigning British Monarch. Her Majesty, Queen Elizabeth II, longest reigning British Monarch on her way to preside over the official State Opening of Parliament. Darrin luckily caught an excellent shot half way up the Mall of the Queen and Prince Philip being pulled along in the Diamond Jubilee State Coach to Westminster. The ceremony marked the formal opening of Parliament where the Queen gives a speech (written by government) setting out government’s agenda for the coming year. It’s one of the few occasions she gets to wear the Imperial State Crown and the Robe of State. The ceremony is steeped in centuries old tradition. Dating back to the Gunpowder Plot of 1605 the cellars of Westminster are searched ahead of the Queen’s visit. Another custom sees a hostage swap; a Government whip kept at the Palace for the Queen, to ensure her safe return. 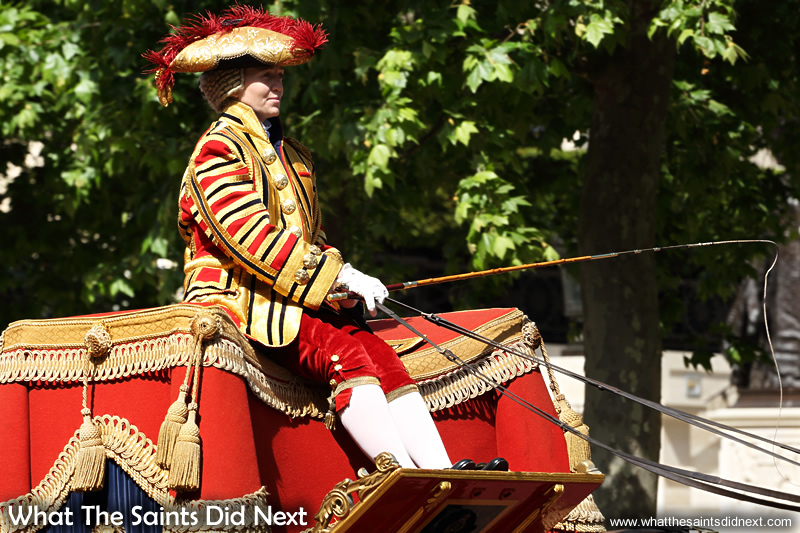 This custom dates back centuries when the monarch and Parliament were on less cordial terms. This is the stuff tourists absolutely love, which draws millions to London each year. 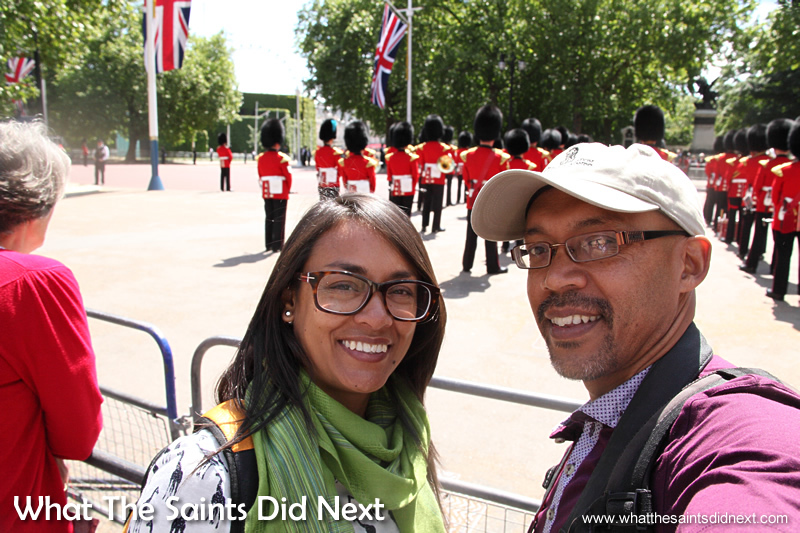 Including us; Darrin and I were thrilled that we both caught our first glimpse of Her Majesty. 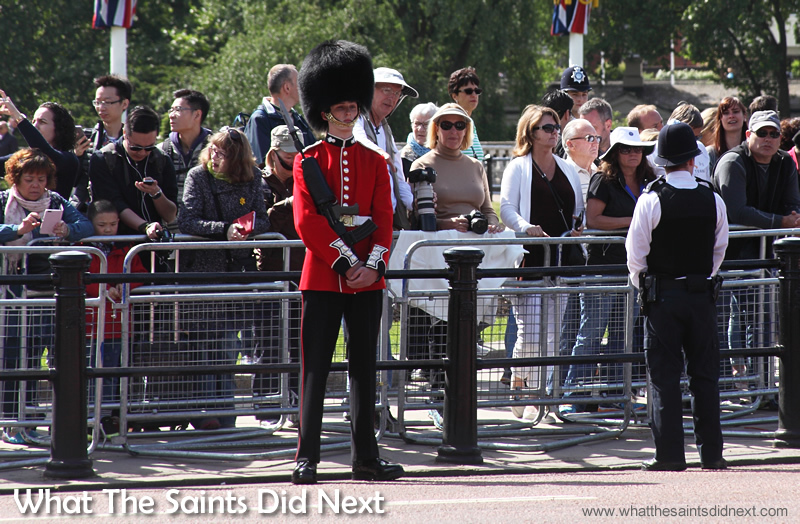 A memorable day when we saw the Queen for the first time. With today’s milestone reached the Queen becomes a record breaker at 89 years old. Her eldest son Prince Charles is also a record holder; aged 66 he is Britain’s longest serving heir. 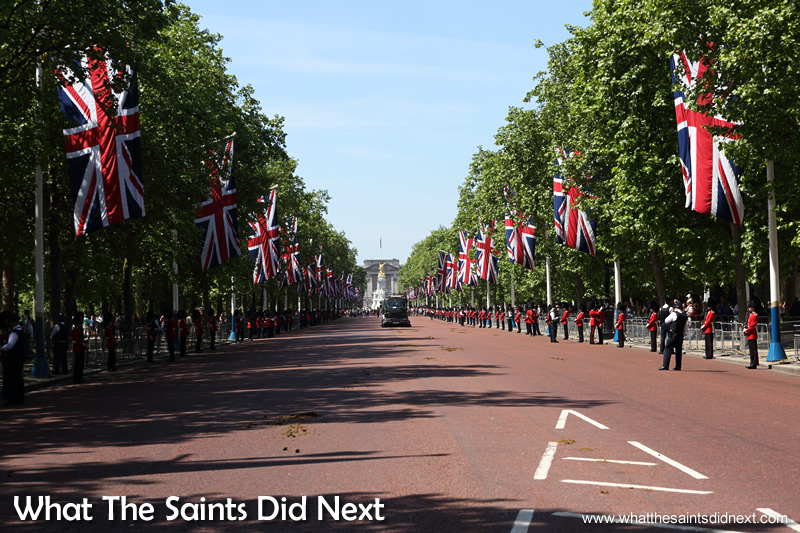 The Mall after the parade has passed through. Another good story and wonderful photo’s. Long Live our Queen.